Chemistry and Innovation – ExSact - Exelus Inc. The fast growth of natural gas production from unconventional sources is creating a need to develop technologies for its efficient use. An estimated 2 quadrillion cubic feet of natural gas is held in these unconventional reserves in the US, enough to supply the nation’s needs for many decades. Methane (the largest component of NG) is currently used in such important applications as the heating of homes and the generation of hydrogen for ammonia synthesis. Converting methane to methanol is a well-established method for monetizing methane. Unfortunately, methanol’s direct use as a fuel has several barriers including low energy density and infrastructure requirements. 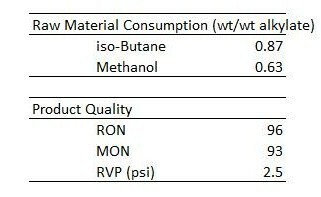 Methanol to Gasoline (MTG) technologies have been tested in commercial situations, most prominently including Mobil’s MTG plant in New Zealand in the 1980s. A recent develop at Exelus is the M2Alk two step solid acid alkylation process that produces alkylate from methanol and butanes. The first step combines mixed butanes and methanol over a unique solid-acid catalyst to generate light olefins (ethylene, propylene and butenes) with over 90% selectivity. The exotherm of the methanol to olefins reaction is matched by the endotherm of the iso-butane to olefins dehydrogenation reaction. Stable catalyst performance allows the reaction to be carried out in an adiabatic fixed bed reactor. The light olefins are then fed to the second step where they are reacted with iso-butane over the ExSact catalyst to produce premium quality alkylate.